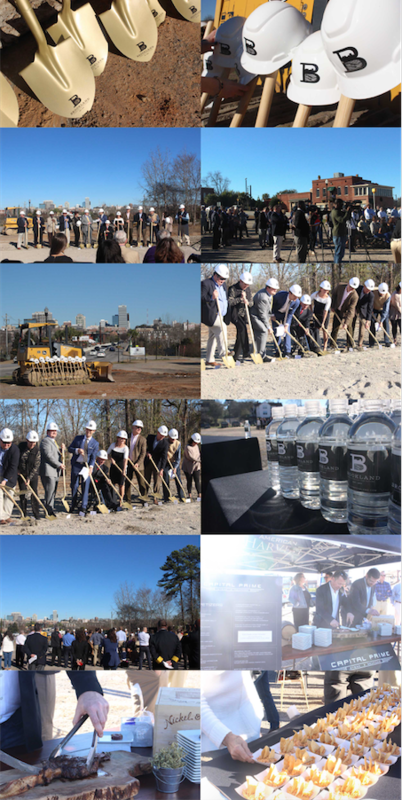 COLUMBIA, S.C.— The groundbreaking celebration for Estates & Companies new mix-use residential community, Brookland, took place in West Columbia last month. The air was filled with excitement and anticipation as Charles Jackson Jr. from Brookland Baptist Church gave the invocation. Over 200 people were in attendance and listened as Mayor Bobby Horton and Estates & Companies spoke about the vision of the project. The crowd included business leaders, city officials, restaurant vendors and members of the community who were all excited to restore the old Brookland name and revive the area through creating a live, work, and play community. Matt Mundy, of Estates & Companies shared his vision for the development, commenting that engaging, active communities flourish the most. He explained how the Brookland development will connect State Street to the river, and serve as the cornerstone for a thriving future in West Columbia. The phrase “Bringing Brookland Back” was coined at the groundbreaking and refers to the historic Brookland district established in 1894, which served as a residential community for mill workers. Mayor Bobby Horton told the story about the community of 200 residents who named the area Brookland after the brooks and streams in the area. He then reflected back 13 years ago when the land was initially ready to be repurposed by the city and how special it was for Estates & Companies to be a part of the process and to bring their vision to the revival of the historic Brookland district. Mundy went on to point out the planned location of a public parking garage, public on street parking, parks, retail stores, restaurants, and a public plaza showcasing skyline views to host future social events. He described the rooftop lounge that would overlook the Congaree River and Columbia skyline, the saltwater pool with sunning ledges, outdoor kitchen and firepit, State of the Art Fitness Center, and Coffee lounge. The entire Brookland team was grateful for the overwhelming support from the City of West Columbia and the community. It is expected that this community will be a spark for future growth in West Columbia.